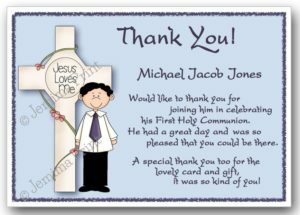 The standard wording on this design is ‘Thank You….. Thank you for the blessings that you sent my way, and your presence on my special day. 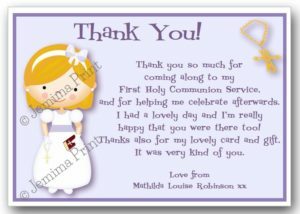 I’ll treasure the memories of my First Holy Communion in my heart forever. Your generous and thoughtful gift was greatly appreciated – Thank You so much! Love from (name). 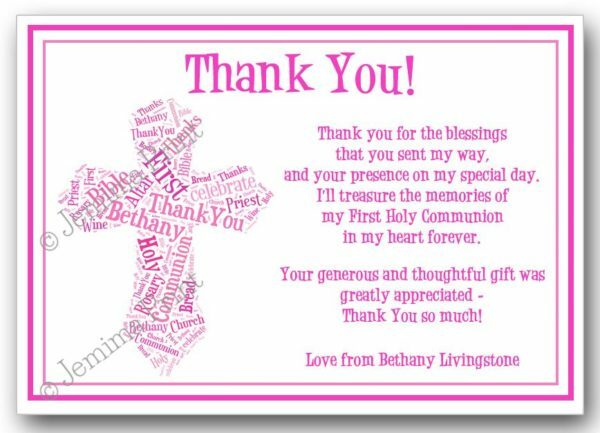 Please send me the name to personalise your thank you cards via “order notes” at the checkout. If you would like to see a proof before they’re printed please request one when sending details. The price is for a pack of 10 cards, complete with white C6 envelopes. Each design measures approx 14cm x 10cm, and is postcard style, printed onto 300gsm card (textures may vary). Postage for additional packs of 10 paid for in the same transaction will be charged at just 10p per pack. Orders are usually despatched within 1 working day of approval of proof.